The highest votes (42%) in The Iranian survey went to the late Prime Minister Mohammad Mossadegh, leaving little doubt who the general public considers the most significant personality of the 20th century. See comments from voters below. 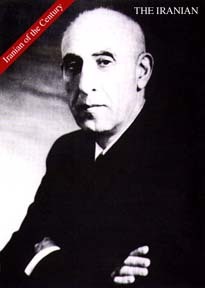 Also see photo feature on Mossadegh here. Back to the Iranian of the century main index. * He was by far the biggest Iranian patriot of all the politicians we have ever had and did for the country what no one ever did for Iran. Javid V.
* A true Iranian who believed in us as people who can decide for ourselves. God bless his soul. Mani V.
Gathering views and data on Iran's "first democratic leader"